Discussion in 'Vendors' started by sTE610vE, Jan 2, 2010. Another order. 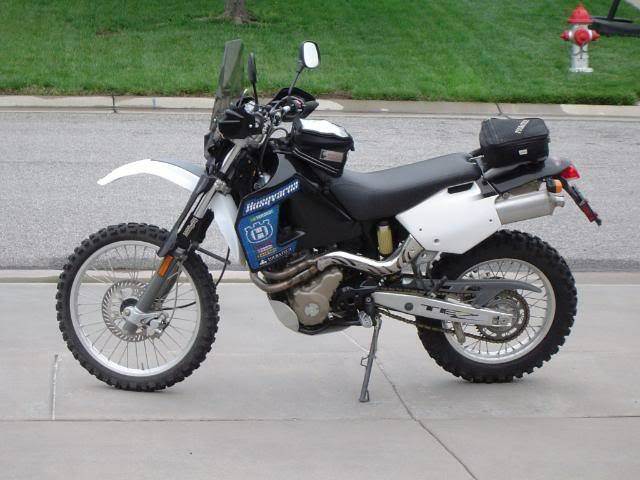 This is just what I've been looking for to stow on my KLR. Arrived,...really fast. I love it. Its nice and compact and clean. Great job. PaulGinAZ VW's and Adventure bikes. Hi Steve-- I just sent payment for the purchase of one; please let me know if you need any additional information from me to get it to me. Thanks for the order Paul! All the info looks good, I sent you and email to let you know that since sales were so good right before Christmas I am waiting just a few days for the next order of stand to get back from the platers. They should be here middle to end of next week and I will get it right out to you the same day I get them! If that is a problem just repond to the email and let me know. The compact size and light weight combined with the ease of use were all major goals in the design. Steel is really the best material for this job because it's strength to weight ratio is much higher than other materials like aluminum. In other words you use less material and get a much higher strength and the entire Trail Stand only weighs 10 oz. I have seen some other aluminum types but they don't seem to publish what they weigh, even though they are larger diameter and not able to work on taller bikes. Some home made aluminum versions have 2-3 times as many parts and weigh twice as much as the Trail Stand. So don't be fooled that just because it's aluminum it is lighter, "the devil is in the details" as they say. Steve, I lost my hitch pin, will you sell one separate? I'm afraid to go to Lowe's/Home Depot for the very reason of shear strength. Would hate to get someone hurt by having the stand shear the pin while in use! Hey OKDQ, no problem just send me your address and I will mail you a couple! I can look it up but if you send me your address it will be easier. Since I cant say with 100% certainty that "any" hairpin cotter that is .091" in diameter will work these days with some of the inferior materials that come from overseas let me say that any good quality hairpin cotter 3/32" in diameter will have no problem when used with the Trail Stand. Think about it, the weight you are putting on the pin is the weight you are lifting, I haven't measured it but I don't think there are many bikes that you are supporting more that 75 lbs, maybe 100, none that I have found to my knowledge. So if you need one to get you by don't worry about it, if it has enough strength to spring back like it should it will be hardened enough to do the job. I should do some more testing with "Lowe's type" Hairpin cotters just to be sure but I would be very surprised if they are not up to the task. I remember your order, I bet we know some of the same riders in the area, do you go to "Uncle Daves" Hillbilly DualSport ride in Eureka Springs around the first of April? I bet we know some of the same riders in the area, do you go to "Uncle Daves" Hillbilly DualSport ride in Eureka Springs around the first of April? I went last year for one day of the Hillbilly DS, but I'm planning on attending again this year. Paid to attend the Flint Hills Stampede last summer, but had to bail out at the last moment...going to try to make it this year. I emailed my address to you, thanks for an excellent product and excellent service. Just ordered three for me and my buddies... Now they don't have to ask for mine!!!! Both of these rides are great! I plan to be at the Hillbilly DS ride again this year too. I ride a Husky TE610E here's a pic. I have some Enduro Star Products stickers on the sidepanels these days, look me up at the campfire! I'm planning to lead a ride at the Flinthills Stampede again this year, hope you can make it! Steve, got your email. Thanks for mailing the new cotter pins - I owe you a beer - I'll pay up at Eureka Springs! I sent you an email with details. Even better than "supervising" while a buddy changes his flat with your Trail Stand....not having to get your Trail Stand out of your kit.....Brilliant! The Trail Stands have arrived from the platers and will be shipping out today and tomorrow 2-3 day Priority! The orders will ship in the order recieved, what I can't get shipped this evening by the shipping deadline will ship out tomorrow, Saturday. All orders will recieve emails with the shipping info and tracking numbers. Update Saturday 1/08: All orders have shipped! If anyone has questions don't hesitate to post them! I've been looking for something like this for ages. Looks like just the job, ordered one on Friday, lets see how quick USPS can get one to New Zealand. Update - the stand arrived after 4 days - pretty good service from the US to New Zealand in 4 days! Looks like a great piece of kit, thanks for the quick turnaround Steve. WOW, I didn't think it would get all the way to NEW ZEALAND that fast! They say 6-10 days + customs time, your customs in New Zealand must be really fast! Thanks Wannabike Tell your friends in New Zealand and snap a pic or two of it in action....when you have to fix one of your friends tires of course! INTERNATIONAL SHIPPING is now available to most places by USPS Priority for a flat rate of $19! Since the Trail Stand only weighs 10 oz and packs so small it means you can get 1 or up to 5 Trail Stands shipped around the world for only $19! So if you want to cut that shipping rate even more split it with a friend on a couple of stands. 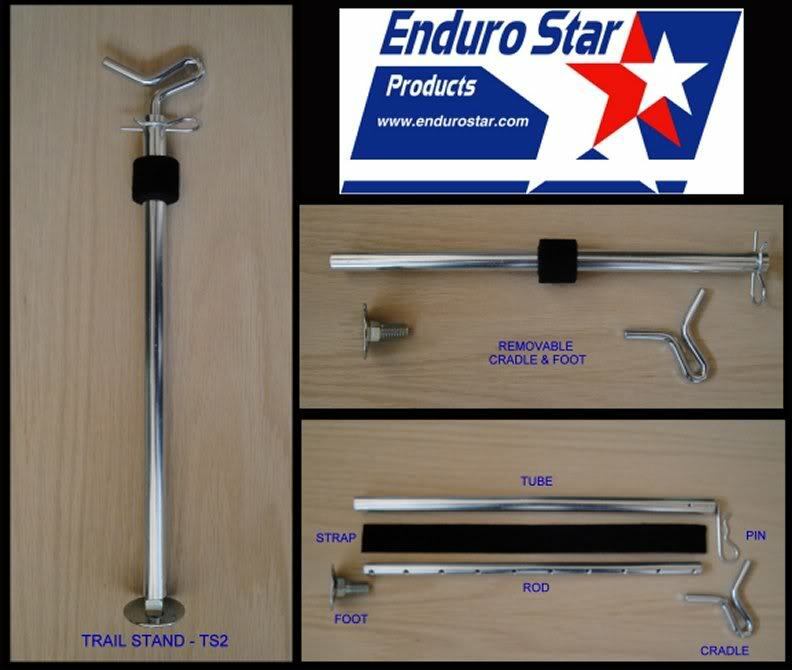 The Trail Stand can be packed completely assembled or with the foot and cradle removed and it extends from 11.5 (29.2 cm) to 20 (50.8 cm) inches tall. And also included is the front brake strap-lock that significantly increases stability on any bike by locking the front wheel brake when working on the rear. I've been holding out on myself and waiting to order one, but pulled the trigger and am happy. It'll undoubtedly come in handy somewhere along the way south! Thanks bigalsmith101 and intotheabis! They will be on the way today! 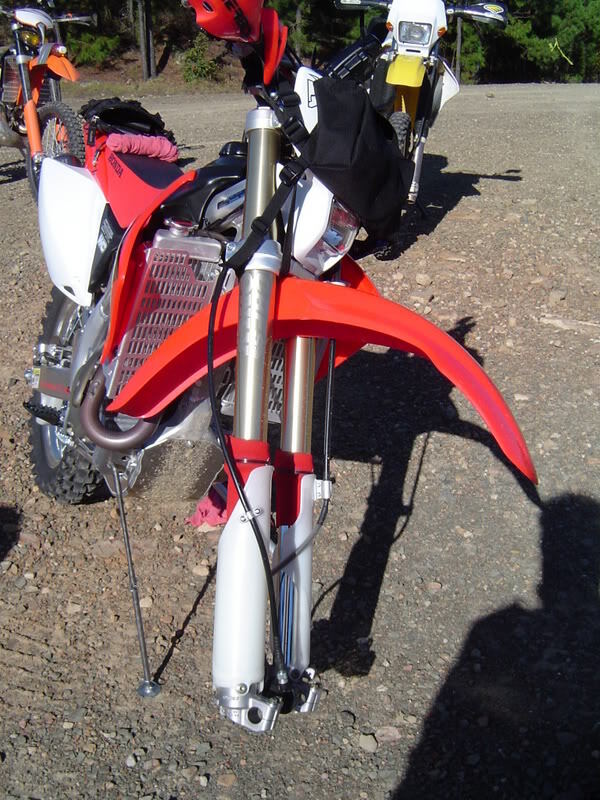 Here's a pic of an earlier prototype holding up a 450 Honda, which shows why you want a stand that is tall enough to work on any bike. This photo was at the top of "bent rim hill" in SE Oklahoma a few years back, 2 flats on two bikes and one nasty bent rim on the Husky (mine) at the top, but what a great ride! Awesome! I honestly don't think that any of the pictures do this Trail Stand justice. I knew I could rely on other inmate's responses in regards to the quality of the product, but I just couldn't convince myself (without holding it in my hand) that it didn't look a bit flimsy. It is hard to tell/see that the TUBE has 2 separate holes, a half inch apart, to accept the pin that will go through both the TUBE and the ROD. The ROD has holes spaced every inch. This allows for adjustment of the ROB inside the TUBE in half inch measurements. Very simple yet clever. The cradle piece in the photos looks a bit dinky, but rest assured, that cradle is NOT going to bed. and is similar in diameter to a #2 pencil. No weenie stuff here. The removable foot is a nice feature, but I don't think I will ever remove the foot. Though, for those inclined it seems like it would make for an easy modification platform for adding/welding on a substantially larger foot. Though I doubt I'll do that either. Hey Steve, maybe you could offer a bigger foot for a couple extra bucks? I bet lots of inmates would jump on that. Last but not least. The velcro strap is a good idea as well. Simply yet effective front brake lever holder. All in all, there is not enough going on in this product not to give it a 5 star rating. Quality product, fast shipping, great customer service, awesome inmate.